Imagine a creamy, nutty oasis...then add rich chocolate, or a drizzle of honey. Nothing compares to the taste sensation of these harmoniously blended Cashew Butters. Creamy, smooth, with a buttery rich taste. Now this is something special. Can’t get enough of those big, crunchy cashews? 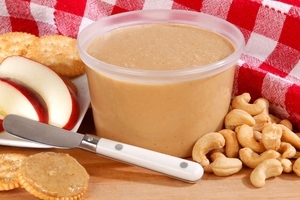 The Superior Nut Company offers delicious Cashew Butter in several delectable varieties. These distinctive Cashew Nut Butters are created using tried and true family methods employed for decades. They start with the finest all-natural ingredients like colossal premium cashews - fresh-roasted on site in our factory - sugar, local honey and top quality chocolate. The superior quality of our Cashews translate smoothly into these divine nut butters. The intense, deep flavor of our raw Cashew Butter is unparalleled. Available salted or unsalted, we also offer Honey Roasted Cashew Butter, Fresh White Chocolate Cashew Butter and Fresh Chocolate Cashew Nut Butter. Forget what you once knew. This distinctive blend of nuts, with honey or chocolate, is a food-lover's new twist on a timeless favorite. Use Cashew Butter in place of peanut butter in sandwiches, desserts and puddings for a complex taste that's at once sophisticated and comforting. 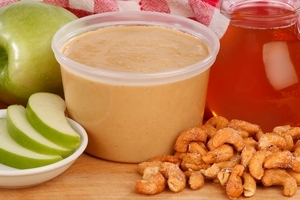 Use the regular raw Cashew Butter on sandwiches, spread the Chocolate Cashew Nut Butter over pretzels or pancakes, and swirl some Honey Roasted Cashew Butter into your morning oatmeal to experience a flavor like none other. However, you use these delectable Cashew Butters, you will also reap the top-notch nutritional benefits of this heart-smart and heavenly nut.